Introducing: 'EVERYTHING you ever wanted to know about ABA" - I Love ABA! Introducing: 'EVERYTHING you ever wanted to know about ABA"
My newest book, "Everything You Ever Wanted to Know about ABA" is now available for purchase on www.Amazon.com. I'm just going to say it: It's my best book so far. (If you are unfamiliar with my previous books, just go to Amazon and type 'Tameika Meadows' into the search bar). I stand by that huge claim. If you buy the book and hate it, let me know and I'll give you a cookie or something. This is my BEST book yet because I combined all the ABA horror stories I hear from families, all the questions parents ask me when I first meet them, all of my kind-but-honest responses to those scared parents, cold hard data, but also warm, soft hope. The book also includes 2 *bonus* Parent Checklists with over 50 suggested questions to ask potential ABA providers. I talk to so many parents with newly diagnosed children and tell them "You should be asking more questions", and they respond with "But I don't know what to ask!". Well.. now you will. 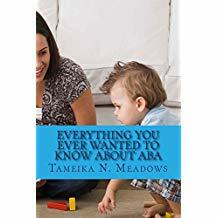 My hope is that any parent who finds themselves nervously facing their computer screen trying to process and digest everything about ABA to make a decision for their child, can instead just get this book and have all their innermost questions and fears addressed in clear, simple language. If you have visited my blog for longer than 10 seconds then you should know by now that clear and simple language is how I roll. How do I know if I'm getting quality ABA treatment? How much should I be paying the ABA provider?/Why is this so expensive? What will ABA therapy cost my marriage, or my family? Do all children with Autism NEED ABA therapy? Who can provide ABA therapy? What training do they need? What setting for ABA therapy (home, school, center) is the BEST? How much therapy is enough therapy? I have NO idea how to read these assessment results from the BCBA. Help. Can older kids or adults benefit from ABA therapy? Isn't the goal of ABA therapy to force Autistics to be "Normal"? What is the role of the parent in ABA treatment and why is parent training so crucial? 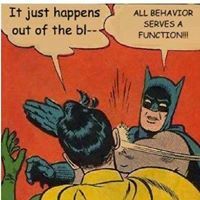 What the heck is a FBA (Functional Behavior Assessment)? How quickly will my child progress/improve with ABA therapy? Why doesn't my BCBA provide direct therapy to my child? What is the difference between Non-verbal and Non-vocal? Is ABA therapy the right choice for my child, and for my family? What will my child be like after years of ABA therapy? What should I expect? Why are ABA providers so judgmental about sensory diets/sensory integration? Why can it be so difficult to obtain ABA treatment for older kids/teens? Why can't ABA sessions be 30-45 minutes long, like so many other therapies? Can ABA ever truly "not work"? 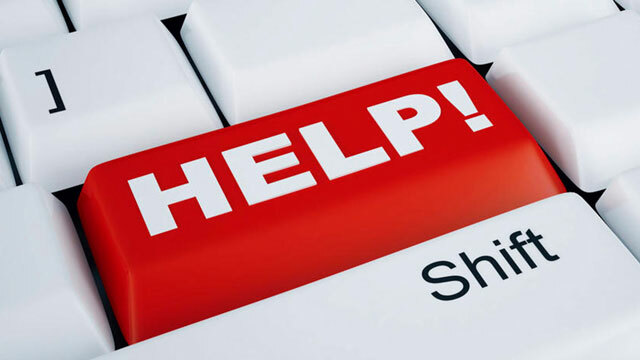 Why does ABA force compliance? Does ABA today still use aversives and punishers? What questions should I ask this new ABA provider we just started with? How can I determine if an ABA provider is practicing ethically or not? Order your copy today, all the cool kids are doing it: Click here to go to Amazon.